I've been diligent at placing items in my Etsy Shop for a number of days now. And, happily. things have sold. Sometimes Etsy can be discouraging since you can go a while without sales...but, I'm happy that I am re-inspired! 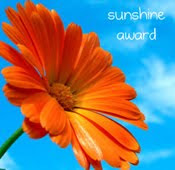 The Sunshine Award is awarded to bloggers whose positivity and creativity inspires others in the blog world. My blog was awarded this honor January 2010. If its not fun, I'm not doing it!